Many exchange platforms out there would offer you an access to different cryptocurrencies, bitcoin in particular. They differ in terms of fees, verification process and trade functions, even though they all basically offer the same service. Safety features and history are important parameters as well, as it tells you how trustworthy the broker is. This article is a review of one of those exchanges that have been around for some time. The Kraken Company has an interesting platform that you should check out. Thus, we made a guide on what is available and what you should be aware of before you invest your funds. Kraken is an online exchange platform where you can trade cryptocurrencies for a fee using different services and marketplaces. The company opened its online space in 2011 by an owner firm called Payward Inc. and is based in San Francisco. It is a regulated company that is one of the first coin exchanges that had price list updated regularly at Bloomberg Terminal. Throughout its history, Kraken positioned itself as the top EUR oriented platform. It advertised itself to traders, especially from Europe, as a broker from whom you can buy and sell coins safely. 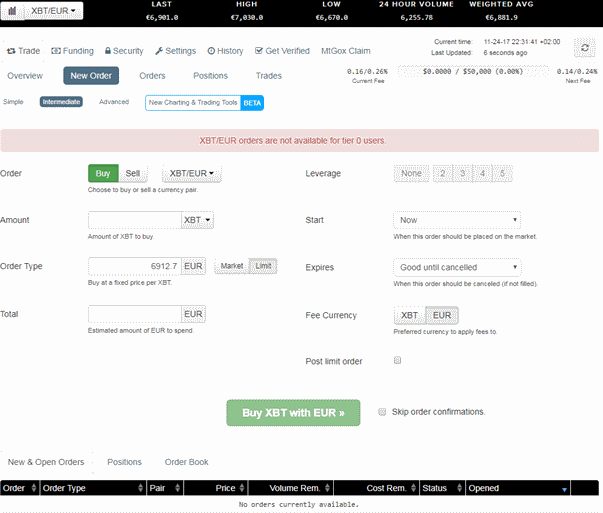 Right now, it is the top EUR currency exchange, offering multiple fiat and cryptocurrencies. The trade is oriented towards more advanced investors in the market, while beginner would need time to properly analyze the tools available. In all honesty, the exchange does not hide it as well. It markets its self as the prime place to be if you have the knowledge of the industry. Unlike Coinbase, which offers several deposit options, at Kraken, you can buy coins only with bank transfers. The accepted bank account payments are international wire and European SEPA transfers. This puts the exchange at a disadvantage when compared to the platform with numerous payment methods. One of such is Paxful, who has over 300 of them available for traders. As for the costs, using SEPA if you happen to live in Europe would not cost you a thing. The same goes with Canadian CAD wire transfers while SWIFT deposits can range between $5 and $15. The more you put in, the less expensive it gets when converted to a percentage. The costs are in line with the industry, as Coinbase, Bitfinex, and CEX.io would charge you 0.1% of your bank deposits as well. Apart from deposit costs, there are other fees that you should be aware of. Like so many other platforms, Kraken also structures the costs through maker and taker order types. If your order provides liquidity, then you are subjected to the maker fees ranging between 0% and 0.16%. Otherwise, taker fees are charged and these range from 0.1% to 0.26%. The volume of coins is what ranges the level of cost that you will pay on a 30-day basis. The more you trade at Kraken, the less of these costs will be. 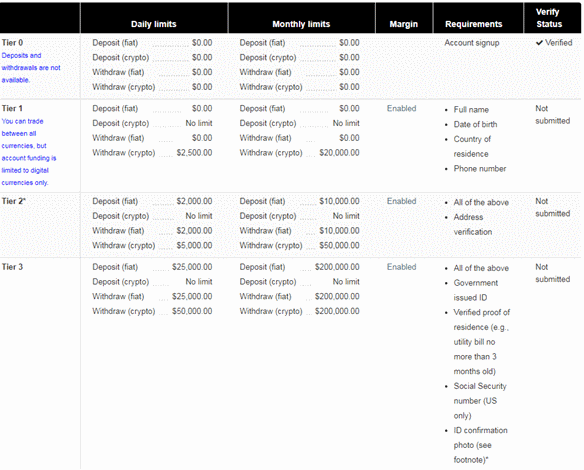 There are also roller and opening fees for several order types in margin trading. These costs stand at 0.01% up to 0.04%, depending on the chosen trade pair. You pay them every four hours your order is online. Kraken works on two platforms that you can use. One is the regular, web marketplace, best run in Chrome explorer. Although a bit on the slow side, the platform works fine at the moment. On the other hand, iOS users can also use Kraken services. Go over to Apple store and download the app for free to trade coins with the tips of your fingers. Android users are left disappointed, as the app for Smartphone is not released as of yet. Coinbase and CEX.io for example, offer both apps, providing them with an upper hand when it comes to phone trading. This is where Kraken really excels, in many aspects. 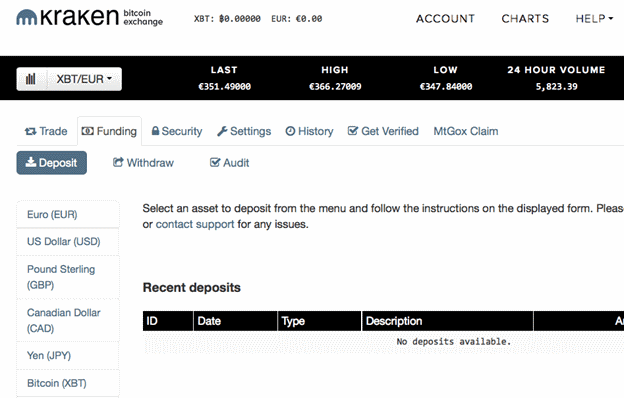 To start off, the exchange is the top EUR trade platform, with large liquidity for European investors. Apart from EUR, you can also trade with CAD, JPY, GBP, and USD as for the fiat currencies. There are many more cryptocurrencies that you can leverage against at margin trading. You pair these with fiat currencies for margin trading orders at the Kraken marketplace. The accepted digital coins are BTC, BCH (bitcoin cash), ETH, Ethereum classic, LTC, Monero, Ripple, Zcash, Stellar, DASH, GNO, ICN, MLN, and REP. The available trade leverages that you can use at Kraken are divided into four sections. These are being 2,3,4 or 5 times bigger than the one you have in your balance. There is a neat function where you can choose the form of your order, that being simple, intermediate or advanced. It still might be a bit overwhelming for beginners but traders who have been in the market for some time can find this interesting. Interface itself cannot be really changed or modified. All you can do is filter out, rank the orders and change trading pairs. At Bitfinex, you could move things around, put different colors on chart lines. Here, that option is not available at all. You are pretty much stuck with that you have at Kraken, which we deem as a disadvantage when compared to BitMex for example. At BitMex, unlike in Kraken, you can choose what types of charts you would wish to see, where the tool sections would be located. Anything is movable, changeable and can be edited while at Kraken, the interface is very rigid. Kraken exchange offers margin trading marketplace where you can place buy and sell orders using numerous crypto and fiat currencies. There are over 70 trading pairs, involving all fiat and cryptocurrencies that you can use any time of the day. The sheer number of pairs makes Kraken so popular exchange, as most of other exchanges do not come near that number. To start trading at Kraken, you need to register your account and verify your way up to tier 2. Provide your personal details, such as name, last name, address and phone number and wait for the Kraken’s response. Support might take a while to answer your inquiry, up to two business days so arm yourself with patience. Go to the deposit page and verify your bank account that you will use to fund the trade at Kraken. Once you have money in your balance, you can start trading at Kraken. The order types represent the “difficulty” of the trade you wish to make. These difficulties are “Simple”, “Intermediate” and “Advanced”. “Simple” trade is basic buy and sells at current price function, where you can choose the current market price or have a limit, fixed price, option. “Intermediate” orders are a bit more complex, as you have an access to leveraging function, where you can “loan” exchange’s coins and increase the trade value. The risk is big but also is a potential profit margin. Here, you can also specify when the order should appear in the books and when should it be liquidated. You even have a choice on how your transaction should be charged (crypto or fiat currency). Lastly, you have “Advanced” option where all trade features and functions are at your disposal. In addition to previous two levels, at “Advanced” you have “Settle Position” function, where you put the future price of coins you wish to get. You can have relative market’s +/- functions where you add a percentage of acceptable price growths/falls. In addition, you can have a conditional close, which acts as stop-loss function like in Bitfinex and BitMex. Here you specify the price of cryptocurrency that you accept the loss for. Once you make the order, depending on the time limit you have set and the success of the order itself, you will find coins in your balance within the expected timeframe. The entire process may take up to 5 business days, even if you choose the instant trading order. The reason is that deposits might travel some time to your balance. Beginners might wish to use “Simple” ordering system, as to get familiar with the Kraken’s functions. The exchange is more close to BitMex, as other platforms have limited number of margin trading tools available. Bitfinex, on the other hand, beats Kraken with over 10 functions it provides its clients. Lastly, Kraken offers no lending market at the moment while Bitfinex does. There are 4 verification tiers that specify the deposit and withdrawal limitations imposed on your account. The first three tiers do not involve any sort of scanned document from your side. At tier 2, you can start depositing funds and trade at Kraken. For more serious traders, tiers 3 and 4 require ID and proof of address. This feature is quite an advantage for Kraken, as many other exchanges, such as Coinbase and CEX.io would require you to verify your identity before you can even start the small trades. Kraken’s API is the basic tools available in all other exchanges, with public methods using GET and POST tools. Private methods use POST only and should be made as instructed by the exchange. Overall, there are over 100 functions that you can use when manipulating public market data, private user data, trade, and funding. The feature is standard in the industry and no real difference is found when compared to Coinbase, Bitfinex, CEX.io, and others. Kraken always keeps a portion of the market’s coins stashed in cold storage, where hackers cannot reach them. Thus, those stored in vaults always back up the assets you have, digitally and financially. 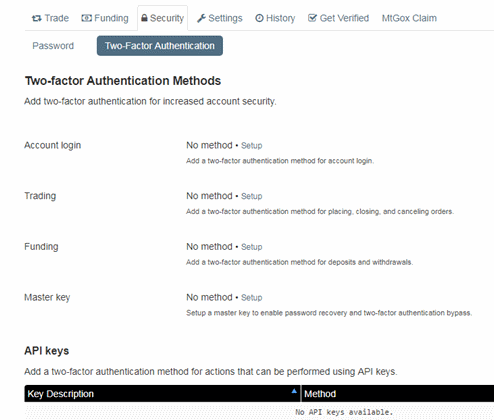 As for user safety, you have two-factor authentication (2FA), PGP encryption of emails and log out settings. The 2FA function works as in any other platform, where you can use QR code or phone number as additional login requirement. You can also receive signed encrypted emails from Kraken if you provide your PGP details to the support. Logout settings allow you to specify how long you should remain online on the platform if you are not making any actions. Since the company is a regulated organization in the US, any business misconduct by the firm’s management or employees, carry legal implications. Through the client policies, you can protect your rights as a person and trader. Kraken has an extensive FAQ section on the dashboard page, where you can find useful information about the exchange. If you have a specific issue at hand, you can directly contact customer support by submitting the request at the “Support” or “Contact” page at the bottom of the website. You should also be aware that customer support is a bit on the slow side since they are dealing with large customer base. The verification check might take up to two days and the same goes for ticket response. Since Kraken holds reserves of fiat money in banks and coins in cold storage, it is possible to use “Audit” check where you can see where your coins are at exactly. A neat feature that no one else has. To prevent hackers from changing your details, password and bank accounts, you can use the global settings lock. The lock blocks any further changes on your account for a specified amount of days. If you happen to report the bug, you get a reward of $100 equivalent bitcoins per bug found. Overall, Kraken is exactly what it markets itself to be. It provides deep liquidity for EUR markets and has different difficulty levels of trade functions. It also does not require identity check for smaller purchases and monthly limits while there are numerous crypto and fiat currencies available for trade. With security features in place, the only thing we find a bit problematic is the lack of deposit/payment methods. Only bank transfers are accepted, meaning that transaction to take place might take some time. Our final verdict is that Kraken is a legitimate place to work with and you should definitely check it out if you do not mind bank transfers and a bit spooky interface.